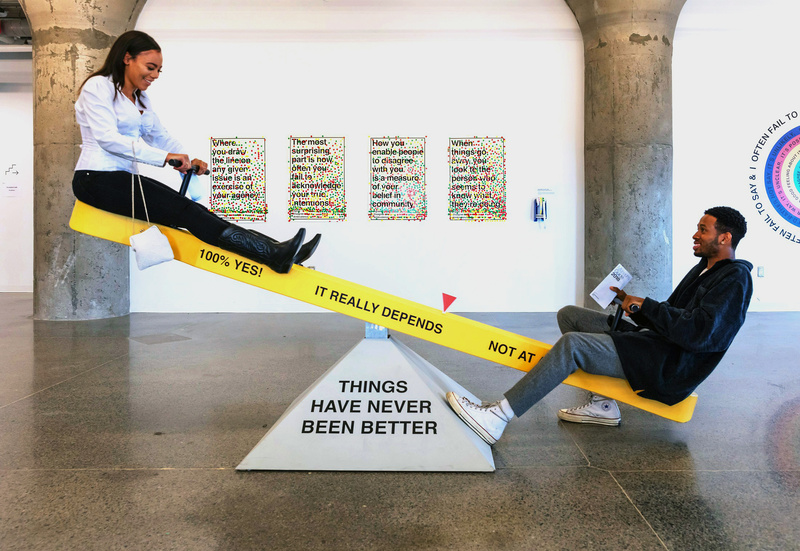 “Striking a Balance”: A seesaw invites a negotiation, one based on a predetermined conspiracy and an ambition to open an uncertain conversation in public. As part of Rehearsing Disagreement with Hiba Abdallah, originally commissioned by the Museum of Contemporary Art, Toronto for the year-long program, Art in Use, which asks: Can art motivate social, political and cultural change? What meaningful role does art play in our lives? How can we use it as a tool? The Art in Use program is supported by an adaptable set of furniture elements —“an office of useful art” designed by Adrian Blackwell. This “office” will host workshops, conversations and events that explore the utility of art. Art in Use has been conceived in conversation with artist Tania Bruguera, the Association of Useful Art and local and international artists. An online platform of socially engaged forms of artistic practice collated by this association can be found at www.arte-util.org. The first Art in Use project is a set of participatory works by artists Hiba Abdallah and Justin Langlois. Together they investigate ways to explore disagreement and conflict through the lens of art and within the structure of a museum. While agreement and harmony might describe an imaginary, ideal space, it also undervalues our lived experiences and the positive effects of difference. Through this series of new works that include a seesaw and a dartboard, the artists invite moments of gathering and exchange around disagreement. They present the argument that co-existing in difference is a generative part of our civic responsibility that can be explored together.